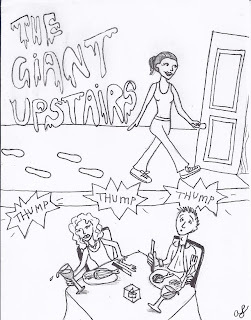 “What is that thumping?” If it sounds like a giant is living in the apartment upstairs, it might just be that your neighbor has a case of tight heel cords. If you are experiencing pain in your calves, you might be the noisy one! Tight heel cords, or what is known as an equinus deformity, is very common. Two muscles, the gastrocnemius and the soleus, make up the calf. Together these muscles join into the heel as the Achilles tendon. This tendon can tighten up from overuse such as running. When we transition from walking to running we spend more time on the forefoot than the rear foot. If your body is not used to running, the heel cord might be stressed to maintain this position, making it harder to get that heel to the ground when walking. Thus, a person with tight heel cords must overcompensate and slam their heel to the ground to force it down. Unfortunately this introduces a viscous cycle. Another cause of tight heel cords can be increased force on the heel. Added pressure occurs not only from thumping the heel down, but from wearing shoes with little to no cushion in the heel, or walking on flat hard surfaces. High heels provide the perfect environment for the foot to develop tight heel cords. Symptoms manifest as a sore calf and heel that worsens with specific activities. You might also notice your ankles seem less flexible. 1. Sit on the ground with one leg extended and the other leg bent resting either behind or to the side of you. Keep hold of both ends of a towel and loop your extended foot in the center. Gently pull the towel towards you. To increase intensity, lean your upper body forward. 2. Place the palms of your hands in front of you on a wall keeping yourself almost an arm’s length away. Bend one leg and step back with the other keeping it straight. Gently push on the wall. In both exercises you should feel the stretch in the back of your leg. Hold each stretch for 5 to 15 seconds, gradually building up your time. Practice these stretches several times a day. Not all tight heel cords can be corrected with daily stretching. Some Achilles tendons are so tight that they only allow for toe-walking. In this instances an ankle foot orthotic (AFO) or a customorthotic is very beneficial. Surgery is an option that is extremely effective. If the equinus is in fact from a tight heel cord a simple procedure called a tenotomy will allow the tendon to be lengthened slightly. Embrace stretching! It improves blood flow and will make your tendons much more relaxed over time. If still unresolved, call 816-943-1111 and make an appointment at Kansas City Foot and Ankle. You can also make an appointment online. Dr. Mark Green can diagnose and treat this condition. Your our neighbors living below you will thank you. The ball of my foot hurts. What could it be?